Different floorboards have different attibutes. The right floorboards and finish can transform a room. Natural hardwood timber floors add warmth, character and value to any home and are extremely long lasting and durable. 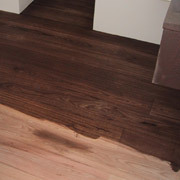 Staining timber floorboards will highlight the natural beauty of the wood give the timber a darker and richer colour. Staining may also assist in hiding damage or unevenness in the finish of the floor. There are many different types of stains available with colours ranging from lighter oak shades through to rich darker mahogany. Choose from water based polyurethane, solvent based polyurethane or oil based finishes. Water based polyurethane finishes are non-toxic, lighter in finish and dry quickly. They are extremely hard-wearing and provide excellent resistance to scratching and abrasion. Polyurethane finishes provide the highest durability and highest gloss. Polyurethane is toxic and has strong smell when being applied and requires longer drying time. They are darker in finish and extremely hard wearing. Oil based finishes are warmer, darker and richer in look and feel. While they are less expensive they takes longer to dry and are less durable than the other finishes.